FUSION is the name of our youth group, which meets every Sunday evening during term time from 7-8.30p.m. The group caters for young people from year 7 upwards, and leaders have DBS clearance to work with young people. They have all done safeguarding training. The aim is to explore the Christian faith in a relaxed atmosphere, whilst having fun, eating, and hanging out with friends. Costs are covered by church members, so there is no charge to the young people. On the first Monday of every month, weather permitting, a group of us pack our sandwiches (and pork pies), don our boots and head off in cars to some suitable locations and enjoy a few hours walking, chatting and enjoying the natural beauty that is within easy reach of our town. We often head to North Yorkshire Moors, but recently have taken in a couple of walks centred on Greatham and also Staithes on the Yorkshire Coast. It’s a great way to get to know one another better and we always make sure that our destination includes a “watering hole” where we can enjoy a well-earned hot drink and “chew the cud” before heading off home, hopefully to sleep well after a few hours of good exercise, friendship and fresh air. Friday Teatime Club meets from 5 -6.30 pm during school term times and the sessions start with having TEA together. The meal is something simple that most children enjoy, such as beans/ scrambled egg on toast, baked potatoes, pizza, sausages, fish fingers and chips etc, fruit and cake/biscuit. There is a charge of 50p per child to help cover food costs. 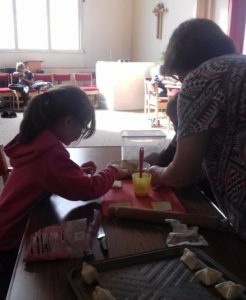 After tea we play games, do craft activities and share a Bible story. We aim to encourage a happy relaxed atmosphere of mutual friendship and respect. All our adult volunteers have current DBS clearance to work with children and young people. Our younger helpers work under the guidance and supervision of the adults. If you would like to know more please contact us on using the church email address or mobile phone number.